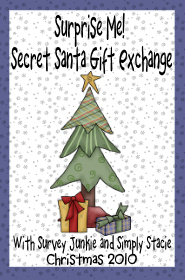 Secret Santa Gift Exchange Blog Hop is no longer going to post on December 20th . We have changed the date until December 24th. Anyone that hasn’t shipped their gifts, please get your gifts shipped no later than Monday. For those of you who are waiting, we apologize and are doing everything that we can to get all gifts shipped in time for Christmas. We posted a sign up last night for those who haven’t received their gifts yet. If you missed that post and haven’t received your gift yet you can fill out the form here so that we can contact your Secret Santa directly.